Whole Health Action Management (WHAM) is an approach for enhancing physical health of people with mental health and substance use challenges. It is especially useful for people with chronic health conditions such as obesity, diabetes, heart disease, and other medical conditions. It was developed by people in recovery from behavioral health conditions. Using the WHAM participant guide, people learn about 10 evidence-based health and resiliency factors, including restful sleep, healthy eating, cognitive skills to avoid negative thinking, and the benefits of service to others. WHAM also involves mental health peer support through weekly WHAM peer support groups at which people set and pursue health goals by developing and following weekly action plans. 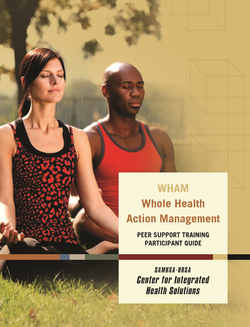 For trained WHAM facilitators, the manual Peer Support Whole Health & Resiliency​ presents the 12-week format for teaching WHAM. WHAM was developed for people with behavioral health challenges, but it can be used by anyone who wants to learn about and develop skills for different domains of health and wellness. WHAM helps people focus on creating new habits and routines. An important underlying principle is that people cannot be forced to change their unhealthy lifestyle habits. Rather, WHAM applies the principle that people are more likely to create a healthier lifestyle when the focus is on their own interests, strengths, supports, and what they see as possible. Through WHAM training, people learn how to develop and use wellness self-management skills, including person-centered planning to identify strengths and supports for enhancing health and well-being. Participants also identify a whole health goal, along with a weekly action plan to attain the goal. They participate in 8 weeks of peer support groups at which they learn to create new health behaviors by following their weekly action plans. They also learn to use a technique called the relaxation response to manage stress, and develop cognitive skills to avoid negative thinking. One section of the guide contains a workbook that can be completed individually or in a group. In group settings, participants can take turns reading the content out loud or it can be delivered in a lecture format. Structured questions help users explore different health domains in relation to their lived experience. Discussion is encouraged to help participants see how each whole health and resiliency factor affects their physical and behavioral health. ​WHAM can be offered in mental health or social service agencies, peer-run programs, community health clinics, or anywhere people can gather comfortably and privately. No experience is needed for people who want to use the guide on their own. It is strongly advised that those planning to teach WHAM to others receive training from the National Council for Behavioral Health. In addition, it is advisable for at least one of the teachers to have experience leading health education groups. 1. It can be helpful to read the entire guide before engaging in specific activities. This gives the user an overall understanding of WHAM’s different elements and how they work together. 2. Since peer support from an ongoing support group is an important component of WHAM, individual users should consider reaching out to others to form such a group following suggestions in the guidebook. 3. In WHAM peer support groups, it is important for all group members to have a health goal and follow a weekly action plan that it shared with other members. This will help everyone’s empathy for the struggles many people face when seeking to change their health habits.